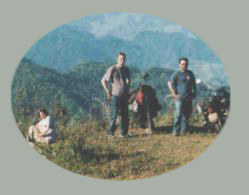 At the risk of repeating John Schwarzkopf's sentiments, I can only confirm that the ride I did on the Minsk in Northern Vietnam was the standout of my travels in South East Asia. The types of road varied between paved, dirt, mud, wet and non-existent, and although the riding was at times challenging, it never bordered on being dangerous. Rather, it was just a heap of fun. Dodging other bikes, trucks, water buffalo, chickens and dogs on a variety of surfaces was far more interesting and entertaining than sitting on a bus for a few hours a day. We had a great guide, too. Whenever anything needed to be done or said, he was always there to help us out. I'd only be interested in finding out whether his translations, particularly under the influence of his beloved liquor, were actually accurate. When you throw in the amazing scenery and the friendly hospitality of the Vietnamese people, you can understand why I would recommend this trip to anyone, regardless of their biking experience, as a must-do in Vietnam.